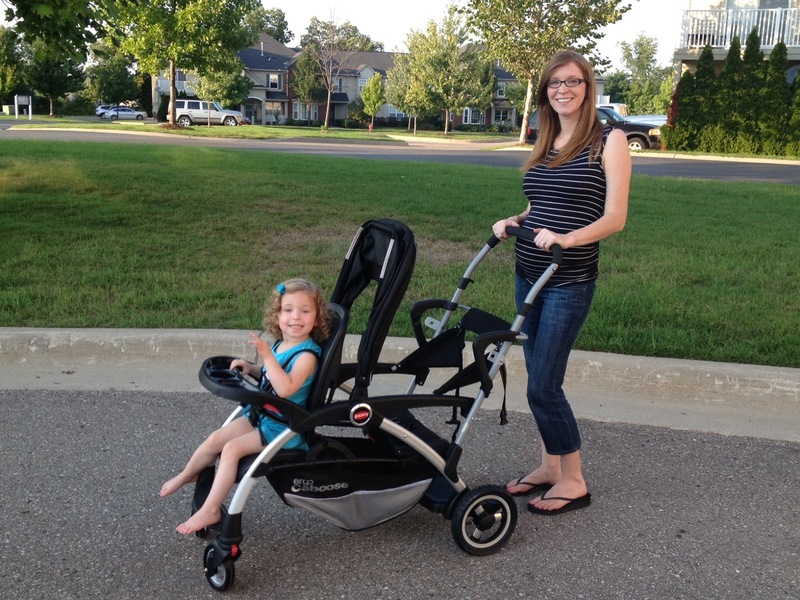 And I Thought I Loved You Then: Love Love Loving our Joovy Ergo Caboose! As we get closer to Emelia's due date, more and more things set in about having two children. Whether it is how I am going to be out numbered when I am home alone, back to changing diapers or all of the contraptions we need to pull out of storage. Our family loves to be out and about. We go to the park weekly, go for walks around the neighborhood whenever the weather is nice and trips to the zoo a few times a year. 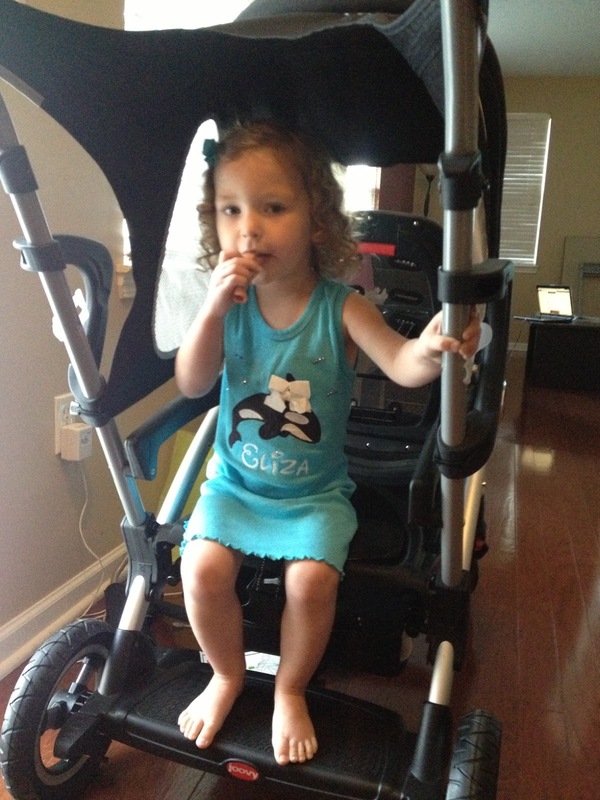 Eliza still loves to ride in the stroller and it hit me...I am going to need a double stroller. I looked at a lot of strollers-side by side, front and back, jogging strollers, sit and stands and many more. 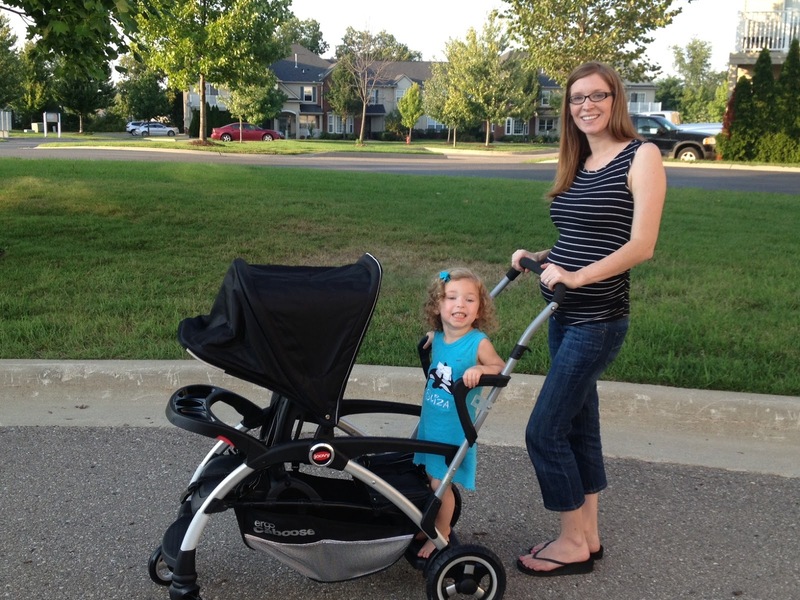 I came across the Joovy Ergo Caboose and fell in love. 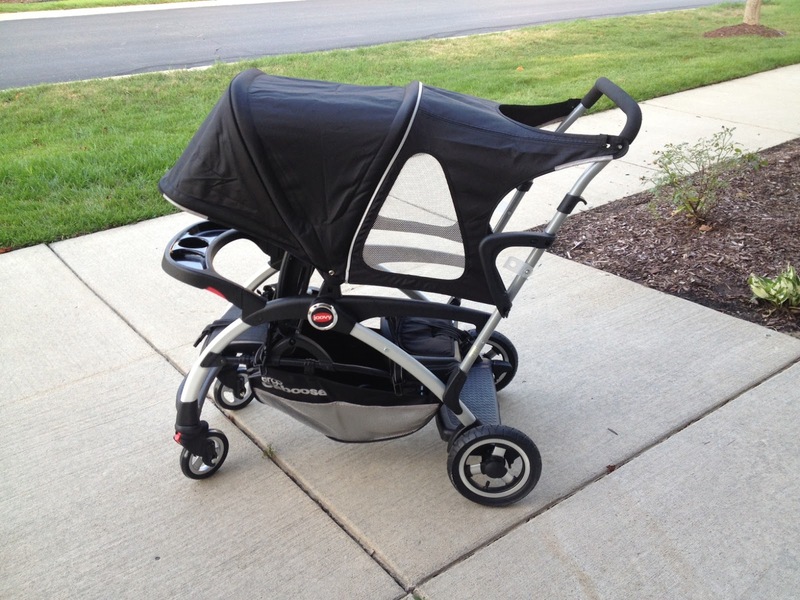 Earlier this Spring we were lucky enough to do a review of the Joovy Tricycoo and now we are blessed with the awesome Ergo Caboose! A front seat for Eliza so Emelia's car seat can be in the back with me. I want her within reach when she is little. A large canopy in the front, Eliza has very sensitive eyes and skin. A rear seat that has a buckle to keep the back passenger strapped in. A large basket for all of our stuff. With 2 kids, there will be a lot! Easy to fold and not too heavy...I am a weakling. I could go on and on about all of the features the Ergo has! I am so impressed with this stroller. I am also happy with the specs on this stroller. It isn't nearly as heavy as you would expect and can hold a lot of weight! 30 lbs. / 13.61 kg. 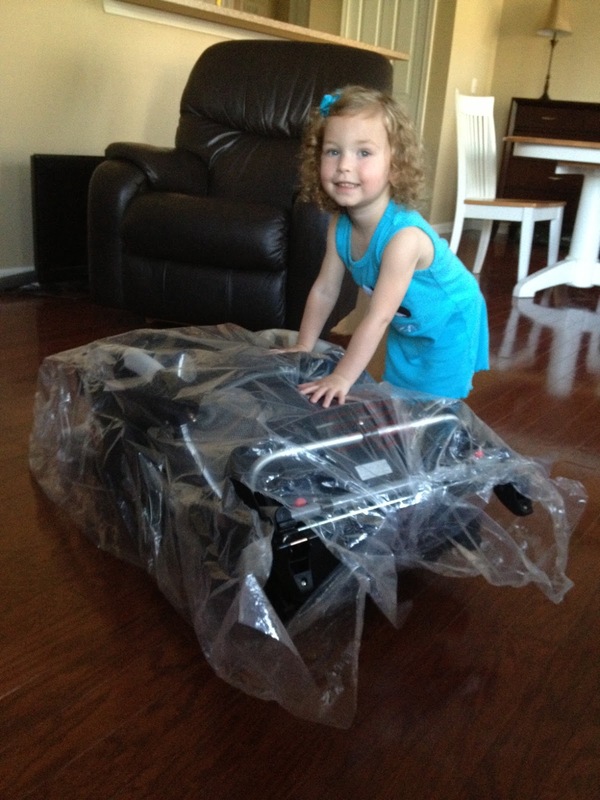 When we received the Ergo, I was a little intimidated by the box, it is large! How many pieces will this be? To my pleasant surprise, it was 90% put together! 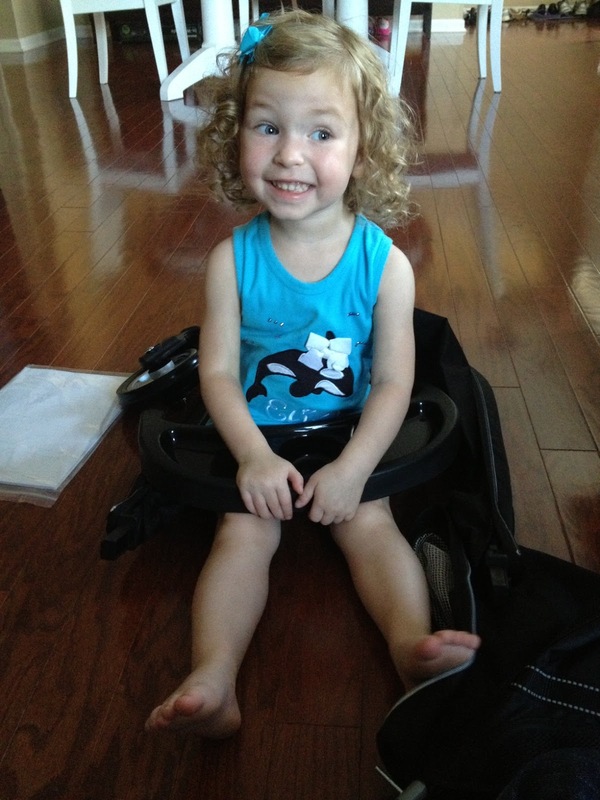 I had a little helper, she was so excited to see her new stroller. As I said, it was 90% assembled, so it was basically putting on the wheels and whatever accessories I wanted at the time. So easy a toddler can do it! Eliza was so excited to get in her stroller, she set it up all around her while she waited. This took me maybe 30 minutes to put together, and that was with my little assistant "helping" me out. As soon as we had it all put together we took it right outside. The ease of this stroller is astonishing. 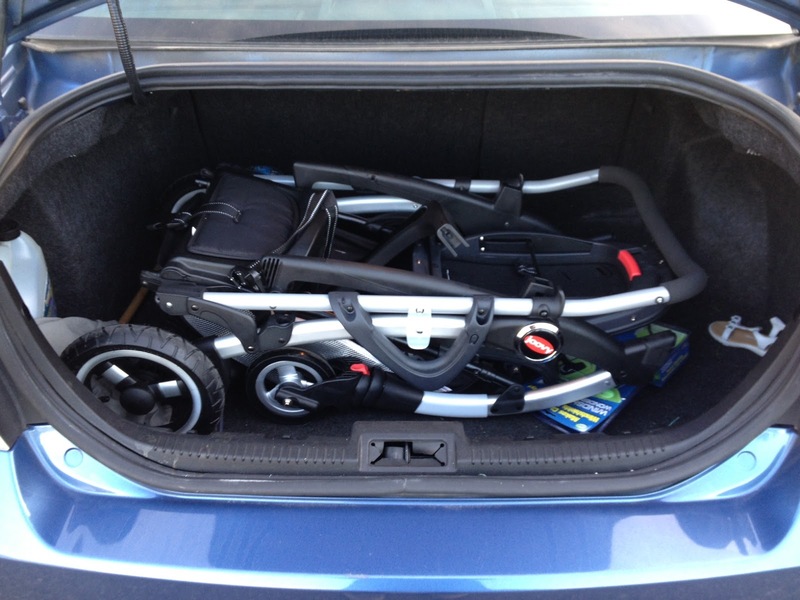 Granted, I don't have two kids in it right now, it was so easy to maneuver. It glides along with the rubber wheels like there is nothing there. We tried out all 3 positions since I know Eliza will be in all of the spots. This is how I see us using the Ergo for the first 6 months, until Emelia is able to sit in the front. I have the canopy pulled back so you can see pretty girls face. The front seat is made of a transitional mesh that is incredibly comfortable and breathes very easily. The tray in front is perfect and so simple to use. It even has a swing arm so it can open right up so she can climb in and out. 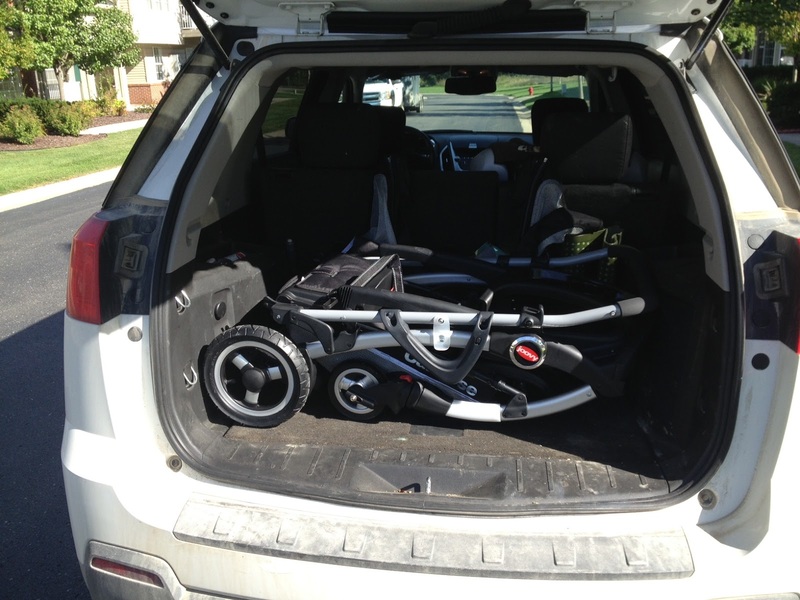 You can also remove the tray and add the individual cup holder(comes with the stroller) for older children. The front seat has two positions which will come in handy when someone needs to rest. In the back I have the car seat adapter. It is universal for most car seats(here is a list of which once fit) and comes FREE with the stroller. The shade comes up over her head and on both sides. Last up is standing up. As she gets bigger I see this being her preferred way to ride. She loves to see what is going on around her. The stand on platform in incredibly sturdy. It is far enough in front of me that even at 5'7 I do not hit her, or the platform, when I walk. She is far enough away from me that I don't feel squished yet close enough to me that if she lost her balance I would easily be able to catch her. Let's talk about folding it up. It couldn't get any easier! It has a trigger fold right on the handle. All you have to do is make sure the front seat is in the upright position, put the canopy all the way forward and pull the trigger! It folds up so smoothly and it has automatic locks that click right into place! I decided to test it out in our trunks. Like I mentioned, we take our strollers with us every where so for the parks and zoo I wanted to know how simple it is to get in and out. The way it folds up is perfect. The handle is right on top and able to pick it up in one easy swoop. I did find that it was a little long for me to fit into our trunks. I had to take the canopy off to get it in, but it is a matter of pushing one button, so simple. Here it is in both of our cars, a GMC Terrain and a Ford Fusion. There is plenty of room. I didn't even empty out our trunks, just tossed it in. It is just as easy to unfold. Lay it on the ground, unlock it and pull the handle up. You are able to hear it click into place and you are all set. Once again, Joovy has hit the nail on the head with this stroller. There is not a single thing I could find that I dislike, this stroller is perfect for us. I can't wait to try this out with both girls in just a few months. Make sure to check back in so I can give you a full review of it in use! 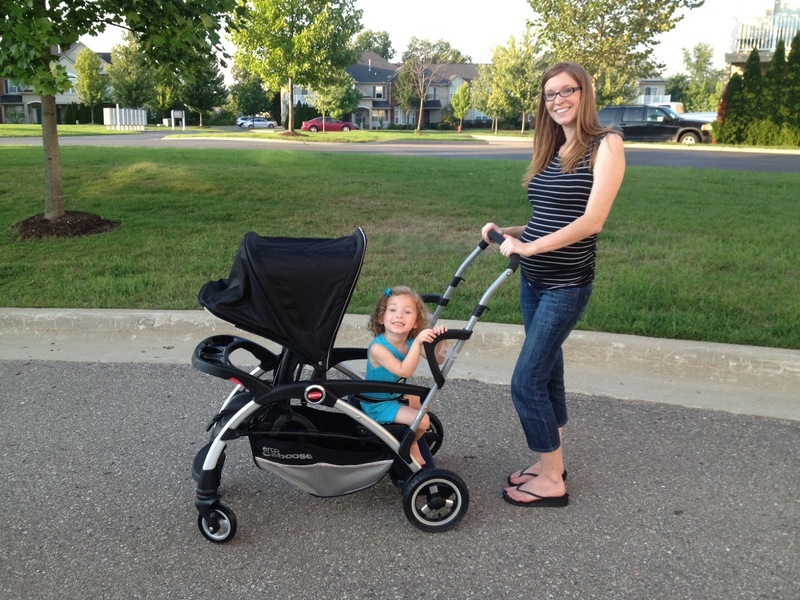 If you are ready to buy the perfect double stroller, head over to the Joovy Store now. 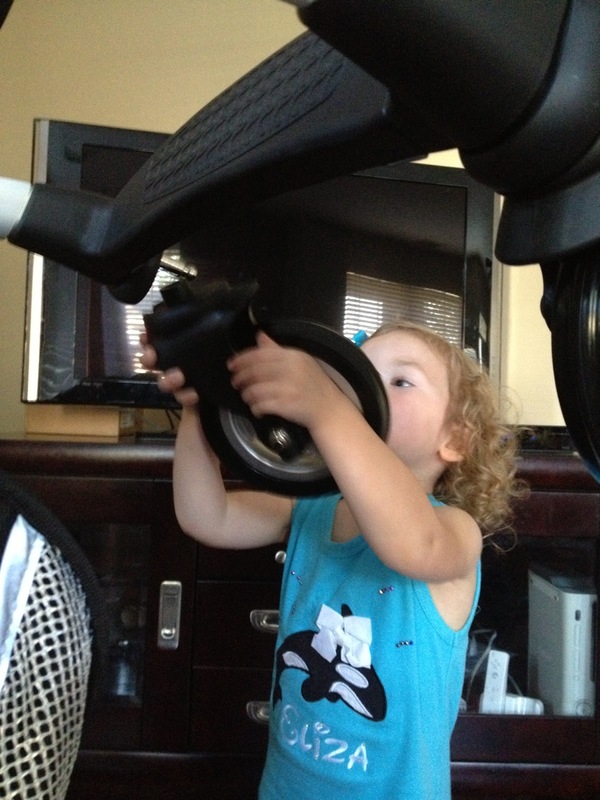 If it isn't enough to hear how much I love the stroller...take it from this girl. 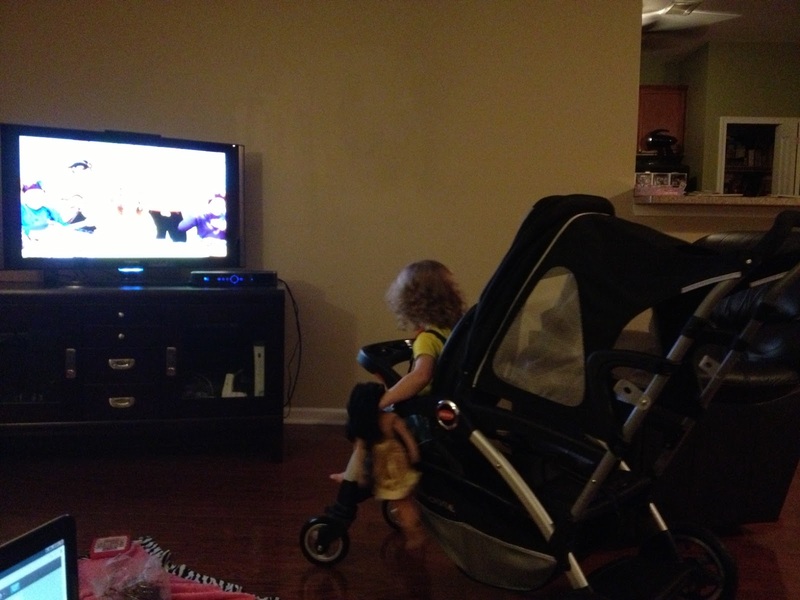 I found her having a snack in it, and she insisted watching her late night show in it. 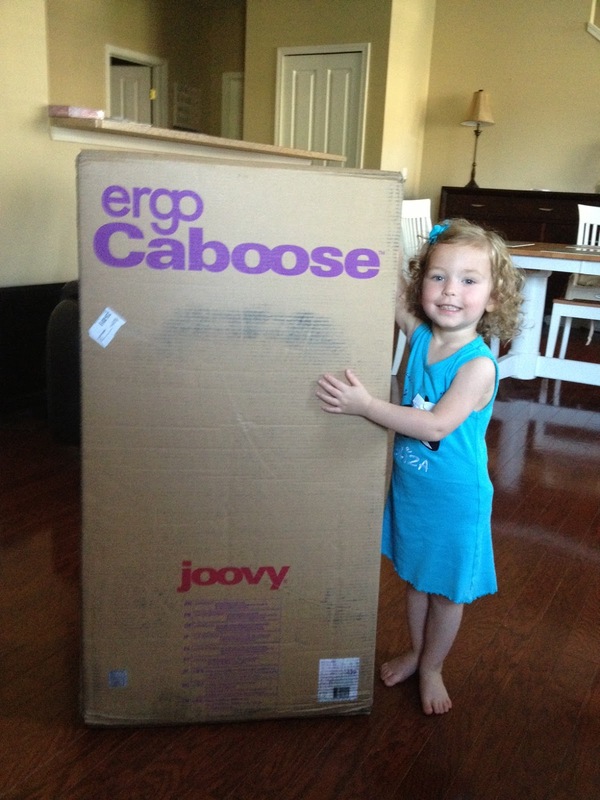 Thank you again to Joovy for providing us with the Joovy Ergo Caboose. All opinions are mine. We were provided the stroller for review purposes.